A question I often get is “Have you heard ‘x‘ by ‘band y’?” I’m always eager to offer up opinions, but like any other music collector, there are albums I simply have not heard yet. Friends and fellow writers continually offer fantastic suggestions, but time and money are always limited. I like to listen to my old music too, and not just stuff that is new to me all the time. Getting caught up on bands I may have missed is a time consuming process. The Kinks are one such band. Growing up as a rocker, I was aware of their hits and the overall narrative of their career. As an adult, I wanted to start with a compilation. When you have a band with a career as long and varied as The Kinks, I very much enjoy getting a snapshot of the whole thing rather than pick off albums one by one. 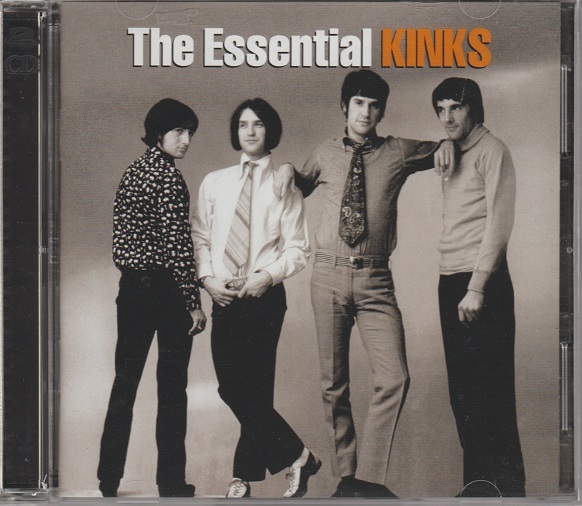 Sony’s double disc Essential Kinks is 48 tracks of rock from 1964 to 1993. It’s a rather monolithic slab, but it does tell a story. The beginning is hard and ragged British invasion rock and roll, and the road is windy. Whether you know these tunes from movie soundtracks (“Nothin’ in This World Can Stop Me Worryin’ ‘Bout That Girl”) or Van Halen riffs (several), many songs are familiar. Early on, their pop and rock stylings could be compared with equal respect to that of those Beatles. The songs are just as unique, memorable and British. The charismatic vocals of Ray Davies immediately capture the imagination. His knack for melody is uncanny. As time goes on, their music becomes more unique and conceptual, but no less captivating. It is here that I discovered my favourite Kinks song, “Apeman”. Perhaps I shouldn’t be too surprised that I already knew many of these songs as covers. Queens of the Stone Age did “Who’ll Be the Next in Line”. Def Leppard did “Waterloo Sunset”. The Jam tackled “David Watts”, and made a hit out of him again. I can also hear a lot of Dave Davies’ guitar in the rock bands that followed. There is no denying the influence of the Kinks. I’ll be lazing on a “Sunny Afternoon” with the Kinks. You approach bands the same way I do. Listen to a compilation album from them and decide if you want to explore them further. However, you can’t deny the contribution the Kinks made to music over the past five decades. It doesn’t always happen this way, although it did for me with: Journey, Frank Zappa, Thin Lizzy…lots more. It all depends too on what I stumble upon first in my travels. They made aome pretty awesome tunes. It’s too bad they kind of fizzled out. The last song I remember was Come Dancing, and during the 80’s I was not digging songs like that. As for that video, it was really nice of Lola to let the boys wear her coats. Speaking of Lola, the original lyrics were Coca Cola and not cherry cola. Actually Brian the original lyric focused on Coca Cola Classic, before the Coca Cola company forced them to pull it, potentially revealing years and years of Coca-Cola business strategy prematurely. They also blocked the band from using a guitar Tab. I read they also had something to do with an abduction and impersonation of a certain EUROPEan rock star. A perfect time for me to plug that I have another set of WTF Search Terms posting soon! There is at times too much music, it is important however to make time for the Kinks. Thanks Neil, I’m glad to be on the path with these guys. Very much enjoying them. I saw some 7″ singles today from a Kinks EP reissue collection. Very tempting. My dad’s a pretty big fan of these guys. Great band. I saw Sunny Afternoon, their musical. Really good too. Hey thanks for the comment alexraphael! I didn’t know about the musical. I’ll check out youtube! I had a Kinks compilation many years ago. All I ever needed, really. Dunno where it is now… maybe time to have a look for a cheap copy of this to replace it. Why not eh? These are reliably good most of the time. Reckon so, Mike. The one I had was a cheap ‘20+ hits’ disc of some sort. Very good, but sadly gone! (I have been known to be careless with discs, by loaning them to folks who have held on to them or dropped off the radar). “Lola” wasn’t a B-side. It’s on a great album called Lola Versus Powerman and the Moneygoround, Part One. The b-side of the “Lola” single in the USA was “MIndless Child of Motherhood” – I know this because I played it many times on jukeboxes. I was told this live version is a b side. I’ve edited my sentence to indicate it’s the live version I was referring to. Thanks! I just remembered how much I loved the song Destroyer in grade school. It brings back memories of lugging a huge ghetto blaster to school to listen to at recess. Destroyer was a song I liked BUT DIDN’T KNOW IT WAS THE KINKS! Same with Come Dancing but I know you didn’t care for it. As S.E. Hinton would say that was then, this is now. I was a metal head in the 80’s and Come Dancing was too happy and light. My musical tastes have changed 100 fold since then and I can appreciate it now. I would have hated it back then too. I first knew it was the Kinks when a girl at work played the compilation Come Dancing. And I was surprised it was them. Blew away my preconceived notions. I had no idea Destroyer was the Kinks back in the day. I had no idea who the Kinks were either. But it hot them on hard rock radio, and I liked it.